Gonzalo Fernandez Castaño with the trophy. 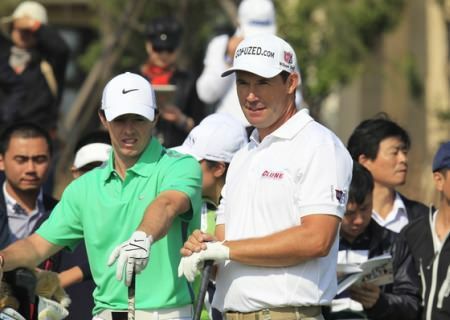 Picture © Getty ImagesThe good news for both is that that they still have one event remaining to close the gap - €54,486 in the case of Harrington (67th in the Race to Dubai) and just €3,586 for McIlroy (62nd). Neither set the world on fire as they teed it up together in the final round at Lake Malaren with McIlroy finishing birdie-par-birdie just to shoot a 73 that left him tied for 27th with Harrington, who had two double bogeys on his front nine in a matching 73. Both earned €48,894. While McIlroy is only playing next week’s WGC-HSBC Champions before the season-ending finale - a no cut event which should guarantee him enough prize money to overtake 60th ranked Gareth Mulroy - he has the option of joining Harrington in the Turkish Airlines Open in a fortnight to avoid any last minute embarrassment for the organisers of the Dubai event. The good news for Harrington is that he was ranked second for putts per green in regulation and third in putts per round in Shanghai, a positive sign for the future but also frustrating as the improvement has come when his season is about to end. McIlroy, in contrast, was 33rd for putts per green in regulation and 52nd of 76 for putts per round and has work to do on his short game if he is to win this season. Shane Lowry (IRL) plays his 2nd shot on the 9th hole during Sunday’s Final Round of the 2013 BMW Masters presented by SRE Group held at Lake Malaren Golf Club, Shanghai, China. 27th October 2013. 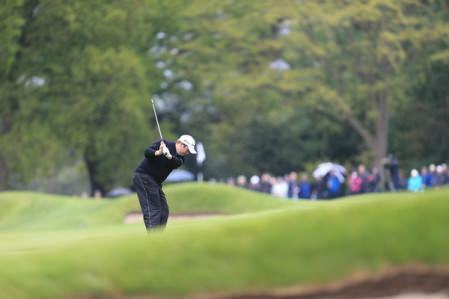 Picture: Eoin Clarke/www.golffile.ieShane Lowry ended up as the top Irishman, dropping just one shot in a five under par 67 to share 24th place on two under par - a shot better than major winners Harrington and McIlroy - and earn a cheque for €54,076. Paul McGinley’s final round 73 left him joint 42nd on three over, though his cheque for €29,264 does not count in the Race to Dubai as he was a sponsor’s invitee. 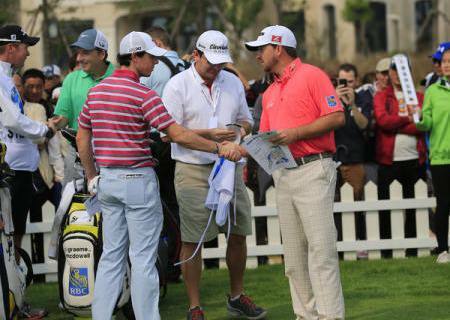 A rusty Graeme McDowell shot 74 to finish joint 53rd on six over and while he earned €16,985, Swede Henrik Stenson closed with a 65 to finish 35th and extend his lead over the Portrush man at the top of the Race to Dubai to €443,725. 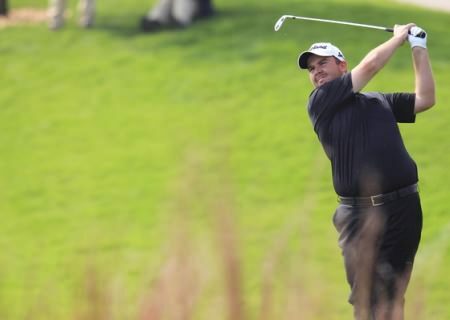 As for the title, Fernandez-Castaño’s closing round of 68 gave him an 11 under par aggregate winning total at Lake Malaren Golf Club, finishing one shot ahead of Seve Trophy team-mate Francesco Molinari – who started the day six shots off the pace – and Thailand’s Thongchai Jaidee. Rory McIlroy was all smiles on the range. Picture: Eoin Clarke/www.golffile.ieThe Spaniard endured a wobble at the final hole, where he found two bunkers en route to a double bogey six, but his earlier exploits had given him enough of a cushion to capture his third BMW-sponsored event, following victory in last year’s Italian Open and the 2006 Asian Open. Despite a front nine of 34, Molinari’s prospects of securing victory seemed to have disappeared with a bogey at the 12th hole. But the Ryder Cup star then embarked on a remarkable run, notching an eagle on the par five 13th and following that up with four birdies in succession to join Fernandez-Castaño on ten under. 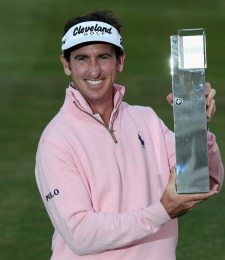 Fernandez-Castaño edged back into the lead with a birdie on the 13th and looked to have sealed a comfortable win with further gains at the 15th and 17th, where he chipped in from just over the green. He made hard work of the last, however, finding sand off the tee and another bunker with his third shot before holding his nerve to collect the winner’s cheque for €851,346 and, with it, a place in next week’s lucrative WGC-HSBC Champions event, the second tournament in the Final Series. He said: “It’s the first event of the first ever Final Series and I got the victory, so it doesn’t get any better than that. This win has come along at just the right time – I wasn’t in the HSBC next week, and also it’s perfect timing because it’s The Ryder Cup qualification period right now. There’s never a bad time for a victory, but this has been just perfect. “It seems that I always play well at this event – it’s probably the whole atmosphere. BMW is one of the great supporters of The European Tour through the years, they know how to run events and they make the players feel so comfortable. Joint overnight leader Luke Guthrie of America finished in fourth place on nine under par after closing with a 71. The lowest round of the day was posted by defending champion Peter Hanson, who surged from joint 31st overnight into a tie for eighth place courtesy of a 63 which included 11 birdies. There are lies and damned statistics but the numbers produced by the European Tour boffins give Padraig Harrington the edge over Rory McIlroy this year. 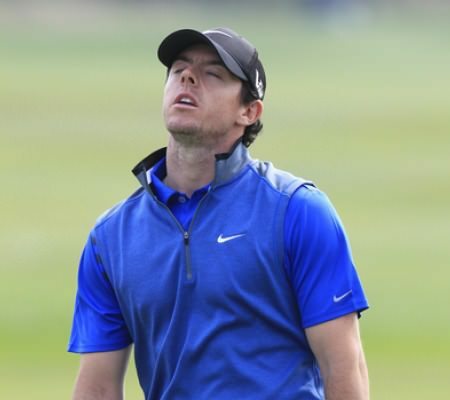 Yes, McIlroy topped the stroke average and almost won the inaugural Race to Dubai while Harrington floundered in swing tinkering hell for half the season before exploding into life in August. 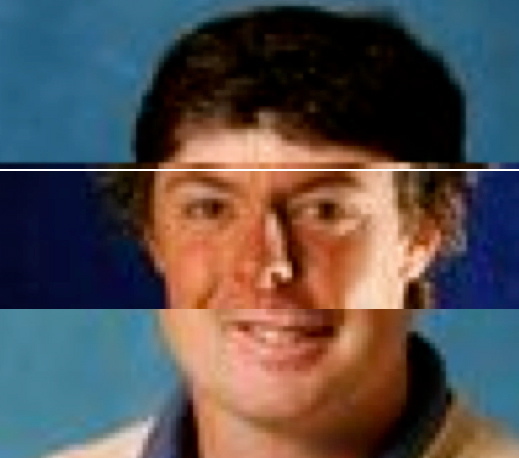 But if you add together their ranking in the nine Genworth Financial Statistics categories, Harrington finished an average of six places ahead of McIlroy.